Summer is obviously a great time for grilling and these Omaha Steaks 18 oz. 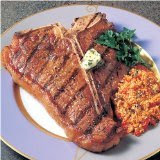 T-Bone Steaks would make a great gift idea for him!! The T-Bone Steak offers "two steaks in one" with one side offering the bone-in Strip Sirloin and the other the Filet Mignon. Great for the guy into a nice cut of beef and perfect for the barbeque. You might also check out some of the other cool gourmet food options from Omaha Steaks , including their Warm Water Lobster Tails which are often combined with Filet Mignon to provide an awesome Surf and Turf Dinner.